Can we have reruns of general and local elections, too? Surely around 50% of us got the wrong result then, whatever the result was. I'd like to start with 1979. Of course we can, WGS. That's how democracy works. Whoever becomes the next leader of the Tories who do well to look at the military budget. The party of law and order have cut well beyond the bone on the defence budget. 2010 = $58314 million; 2017 = $48383 million. Is Mr Williamson banging the drum enough? Just a matter of time before the PM returns to the back benches. No suggestion of who the new leader would be. Probably the most electable Tory leader makes it clear that she is not interested now or in the future. Howard I’m sure that Ms Davidson is far to sensible to swap the Scottish Parliament for the testosterone-fuelled environment of Westminster. Unfortunately no right-minded people want the top job anyway, from any part of the political spectrum. Leaked dossier courtesy of the Telegraph. Howard that dodgy dossier must be at least 2 1/2 months old as both Boris and Davis have been out of cabinet for longer than that. Given that ‘a week is a long time in politics’ it’s an old chestnut by now. Boris will make an unabashed bid for the leadership at Conference after publishing his thesis that is so different to the "Chequers" plan but I believe he will shoot himself in the foot. The party faithful know deep down he is not Prime Minister material. Pity it can't be somewhat higher up. that's a picture of the new tory leader. Good to see Boris Johnson subjected to some decent scrutiny for once in recent days. When he is, he collapses like a pack of cards. For too long he has coasted on his lovable rogue free meal ticket - he is not lovable, he is dangerous. The sooner the country realises that, the better! The media has massive part to play in holding him to account as they would anybody else. Glad you warned us Neil, can't believe no one else said anything! 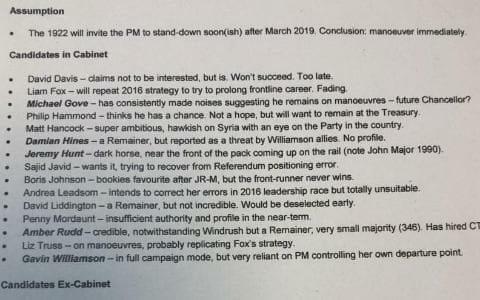 Front runners in Tory leadership battles never get the job and why he is apparently launching a bid now seems rather strange. If he did overthrow the PM it would be just in time for us leaving the EU and the immediate chaos that would bring. Then a resurgent Labour party would demand a General Election which nobody could predict the outcome of. Should be lively at the fringe meetings in Birmingham where ambitious MPs plot their future. Just checked again and the bookies still have Boris as favourite to be the next leader and also just ahead of Jezza as next Prime Minister. If those two lead their party into the next General Election I think Labour would get a clear majority. "Don't be fooled by his oversized victorian suit an cheery demeanor"
That made me laugh especially the "cheery demeanor" bit, he is another one I dislike. He speaks very highly of you, Jan.